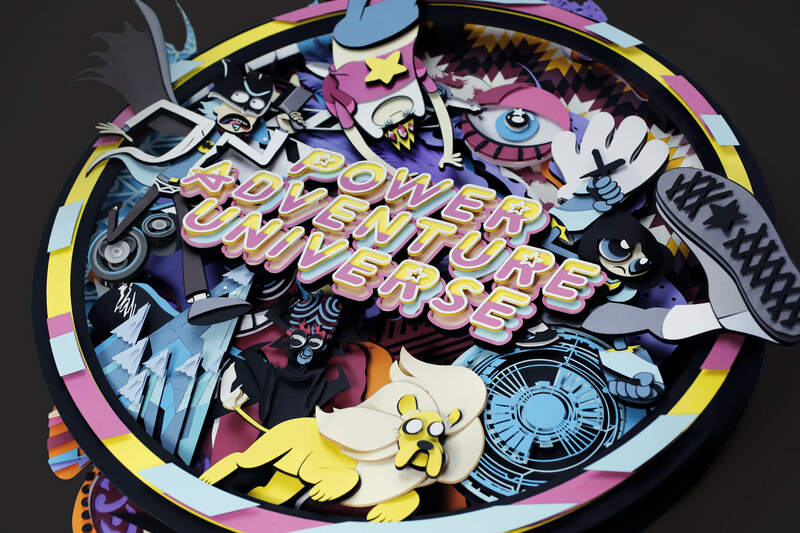 It's been a while since we have posted about our friends over at Shotopop, and since I'm a huge cartoon fan I couldn't resist adding this layered gem to the site. The London and New York based crew was invited by their friends over at WIZZ Design to create a plagiarized artwork for their exhibition, PLAGIAT. They decided to go with a medium they have used previously, paper. Since they also shared the same affinity for cartoons, they created an amazing mashup of all of their favorites as a layered paper relief. They've got the Power Puff Girls, Fin and Jake from Adventure Time, and Aku from Samurai Jack just to name a few. And of course this colorful masterpiece is bursting to the brim with energy. Patrick Cabral wowed us previously with his initial exploration of the animal form. 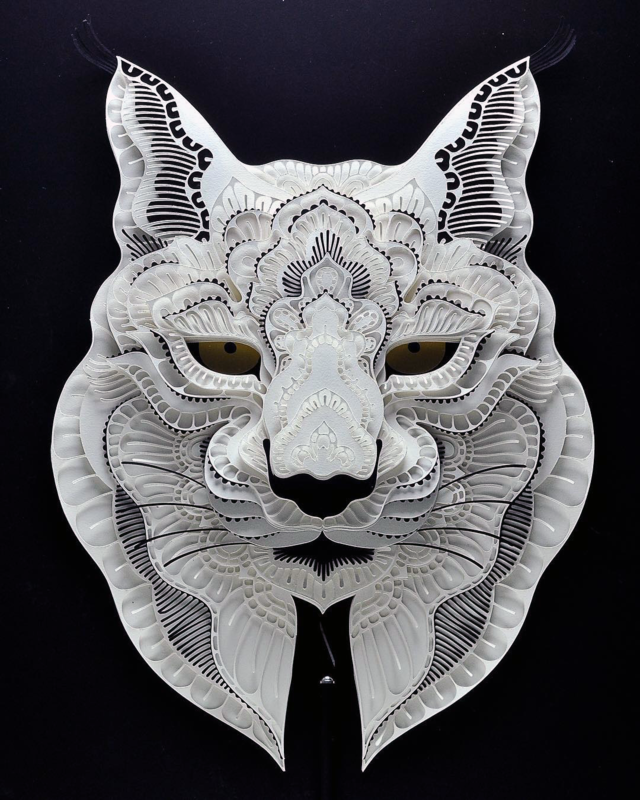 He was able to accentuate the gorgeous details such as fur and unique markings using several sheets of paper, meticulously cut into beautiful and unique patterns, which were then layered to provide depth. 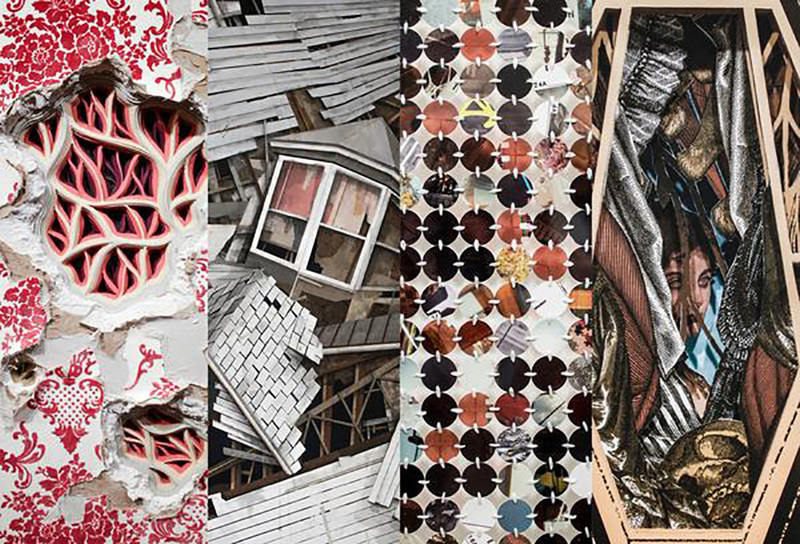 This time each paper relief shows even more detail and has the delicate nature of lace found through each pattern to further show how fragile they are as a result of their endangerment. He has not only continued this incredible series with several more animals, but he has followed up on his promise to donate to WWF to save these animals from extinction! We learned a great deal about Australian paper relief artist Jacky Cheng in our past interview, from how she learned joss paper folding from her grandma to her idea of the greatest invention ever made. Her works are nothing short of breathtaking and utilize meticulous care in their creation. Multiple layers are carefully cut and placed on top of one another and sometimes folded and interlocked to reveal gorgeous mandalas. I still can't believe that Michael Jackson, one of my all time favorite musicians and dancers no less, has left this world. I remember trying to learn all of his dance moves in my mirror back in the day or even watching Moonwalker over and over again to the point of knowing all of the words, classic! He will always be timeless to many people across the world and continue to inspire us within our hearts. There were many tributes since then, but of course it wouldn't be right not to do a small tribute to Michael Jackson on here as well, and of course in paper. 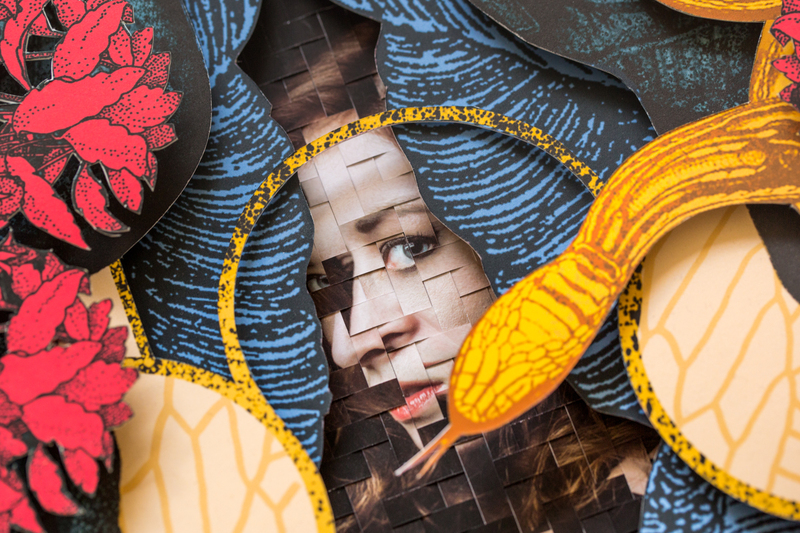 That brings me to the stunning work of Belinda Rodriguez, a freelance designer, illustrator, and paper artist, born and raised in Los Angeles, California. I particularly love her style and how she is able to capture the features of her subjects in her paper portraits using specifically cut pieces to accentuate the facial features like cheekbones or hair and then layering them to add depth and cast certain shadows. 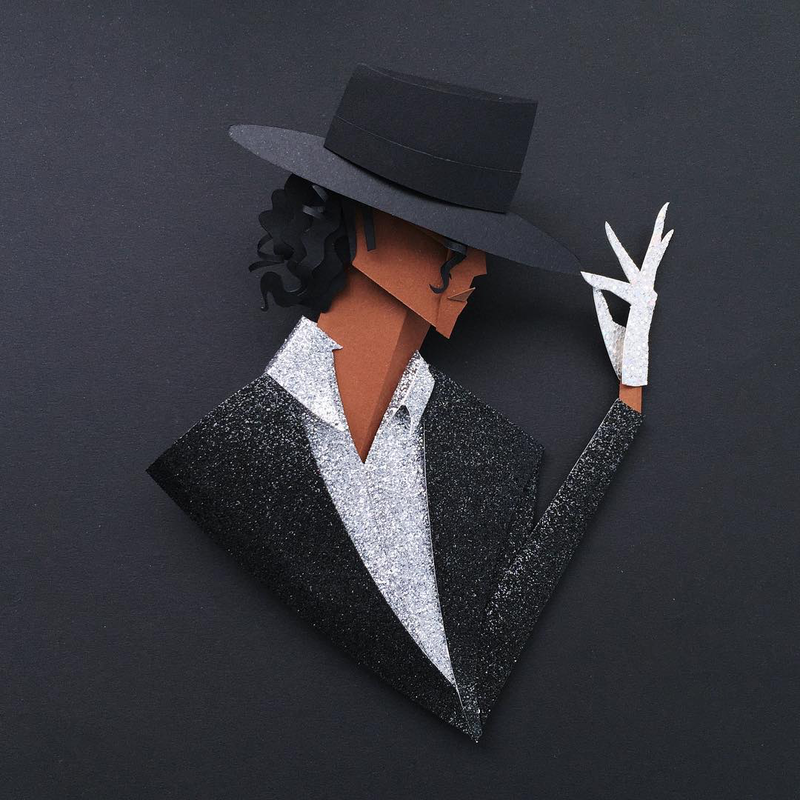 She has done a set of four paper relief portraits of Michael Jackson in very familiar outfits, like Michael in his papercraft glitter outfit and wearing the infamous sparkling glove for Billie Jean, or his outfit for the Super Bowl, adorned in metallic gold and matte black paper. 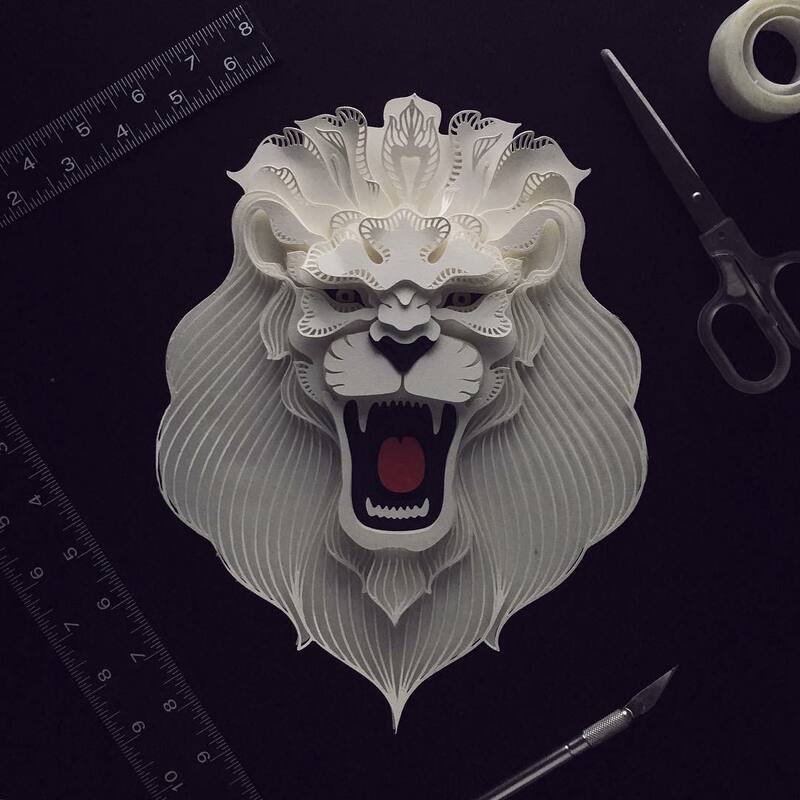 Patrick Cabral is a multi-disciplinary designer based in the Manila, Philippines, whose latest works are comprised of various animals created from multiple layers of paper. Each are delicately cut with unique patterns, accentuating the finer details such as the fur, to explore the natural characteristics of the animal form. This has been an ongoing series on his Instagram account where he states, "I want to provide a contrast of soft materials to a predator." 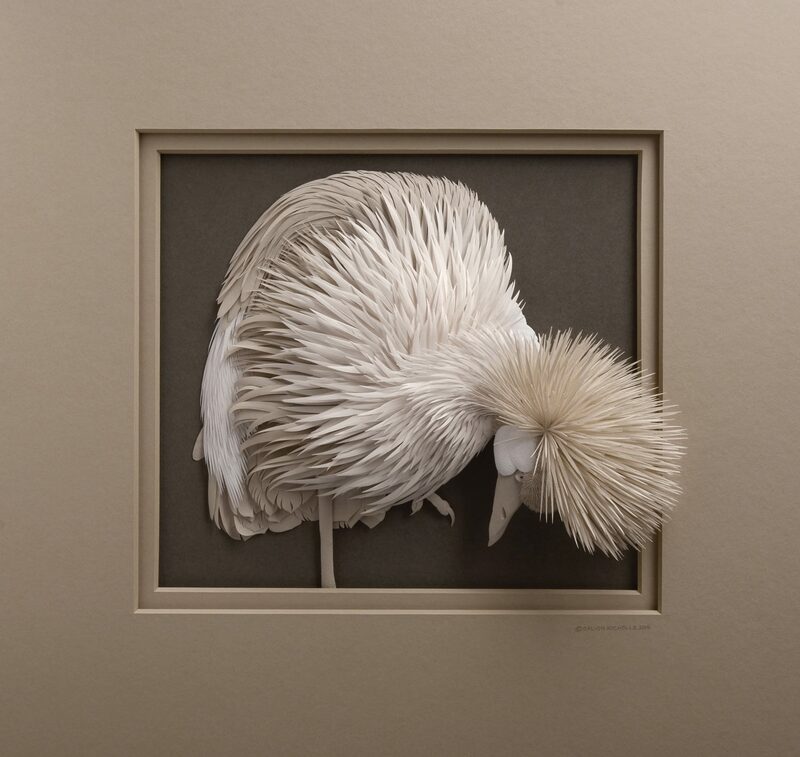 He has since then added to his series with more endangered species like the lion featured above, and hopes to eventually show how fragile some species are and how close they are to extinction. 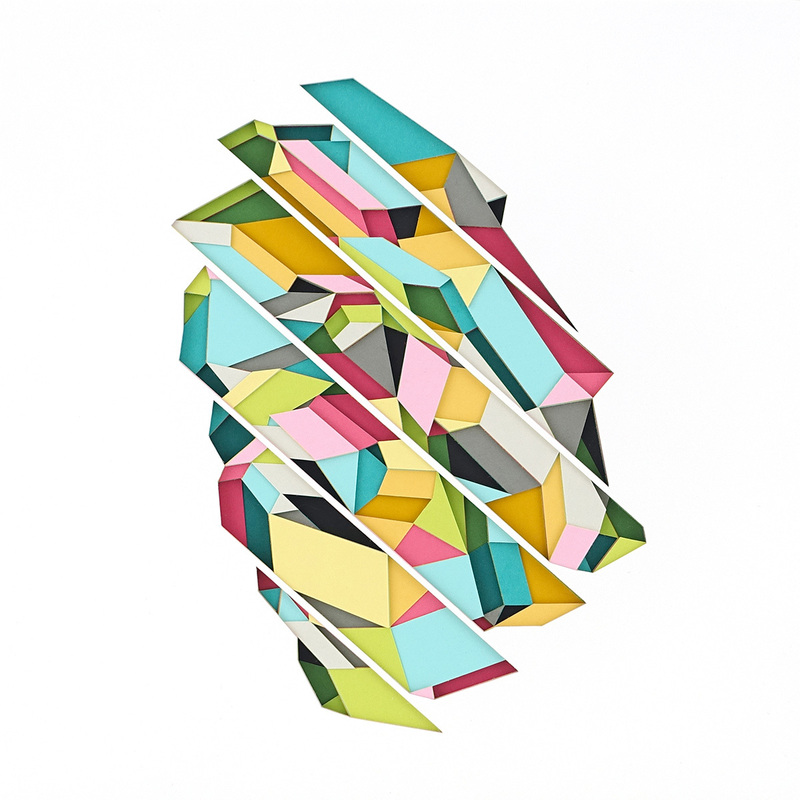 Los Angeles based paper artist Huntz Liu transforms stacks of colorful layered paper in a subtractive way, where he cuts into them to reveal the different geometric paper reliefs. His work is reminiscent of the shapes found in cut diamonds. He uses simple geometric forms that are carefully placed, allowing for the material to be seen and encountered clearly. 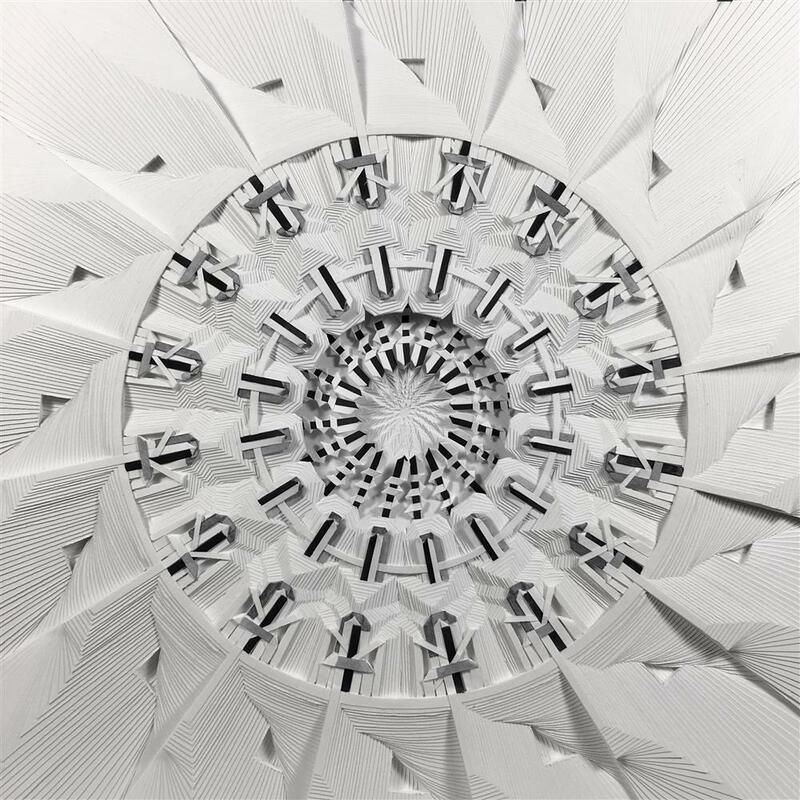 These carved compositions may be conceived as the skeleton of a structure. He’s part of a gorgeous two-person show with Michelle Benoit, titled “Dive In”, at the Muriel Guepin Gallery in New York. It opens this Friday, January 6th and runs until February 11th, so if you’re in New York, go check it out in person! 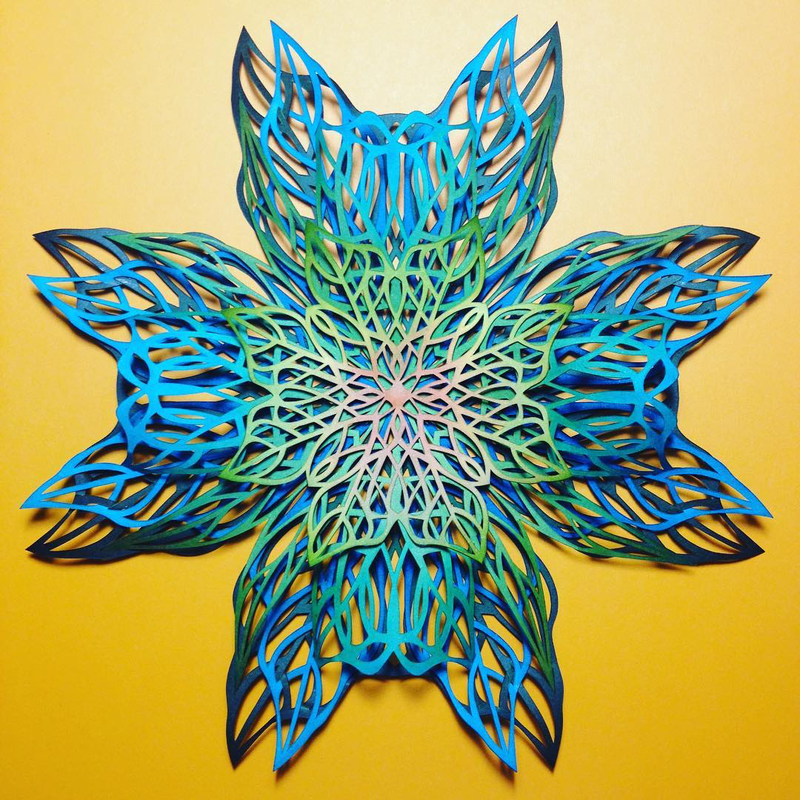 Seeking inspiration from the beauty found in science and nature, Portland based paper artist Chrissie Hart creates astonishing sculptures comprised of several layers of paper, meticulously cut and interlocked to create these incredibly detailed and colorful works of art. Hart is a self-taught artist whose attention to detail is clearly prevalent through these designs. Her process begins by first drawing each design and then scans them into illustrator, where she then perfects each piece with what she claims to be an OCD refinement, carefully removing any unnecessary details and adding others where she deems necessary. She tells Strictlypaper, "I love the lines to be straight and mirrored perfectly. I usually prefer more lines interlacing, so if I see a different shape, I can exclude some of those lines and cut through them to create the look that I see as pleasing."